The second half was much more suspenseful than it should have been after WSU led 27-0 at halftime, but it was still a big victory. PULLMAN — Here are three impressions from No. 25 Washington State’s 34-20 victory over No. 12 Oregon on Saturday night at Martin Stadium. Sure, the second half was much more suspenseful than it should have been after WSU led 27-0 at halftime, but it was still a big victory, so taking a positive overall view despite the letdown. So much for the expected demise of WSU after losing Luke Falk, the Pac-12’s all time leading passer, defensive tackle Hercules Mata’afa, a unanimous All-American, most of the offensive line and a host of other key players. 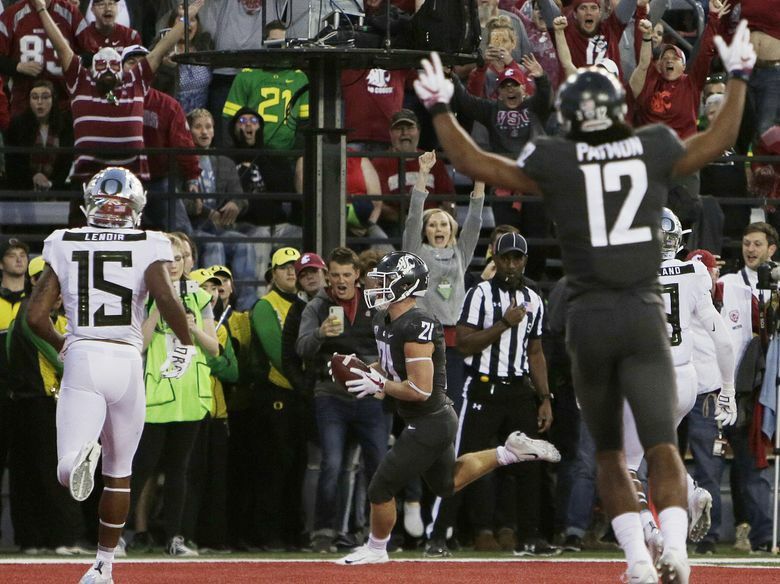 The Cougars, picked to finish fifth in the Pac-12 North, scoffed at the predictions, and it has become clear they were right. A lot of the credit goes to quarterback Gardner Minshew, who after a poor second half, did what a great player does. With the game on the line, he led a scoring drive that all but clinched the win. Washington State is now bowl eligible with its sixth win and has gone over the 5.5 wins Las Vegas set as the over-under for total victories. Washington State coach Mike Leach is building a case for conference coach of the year. Sure, there are tough games remaining on the schedule, including at Stanford and at home against Washington, but the Cougars look like they compete with any team in the conference. The focus when it comes to Washington State is often on the offense, and the excellent season Minshew is having, but this is a balanced team. The WSU defense entered the game second in the conference in yards allowed, and held the potent Ducks to 39 first-half yards while building a 27-0 lead. Sure, the Ducks were much better offensively in the second half, but it was unrealistic to expect another half like the first one. The Ducks had not scored less than 31 points in a game entering Saturday. The defense has been led by linebacker Peyton Pelluer, the sixth-year senior, but he has a lot of help. The secondary, in particular, seems to get better every week, but still gets called for too many pass interference penalties. The freshman running back was highly touted as the Colorado high school player of the year, and is living up to the hype. He is getting more opportunities each week and like fellow Cougar running back James Williams, he is a threat running and receiving, which he showed Saturday. He had a huge first half, rushing for 28 yards on seven carries, and catching six passes for 46 yards, including a 15-yard touchdown. He finished with 40 yards rushing for 10 yards, and he caught seven passes for 51 yards and a score.